STEWART CREHAN teaches in the Department of Literature and Languages, University of Zambia. He is the author of Blake, Context and Ideology. D. W. DÖRRBECKER, an art historian at the University of Trier, is presently preparing a notice of four hitherto unrecorded copies of Blake’s illuminated books, which he located among the holdings of what used to be the royal collections of the Austrian and Bavarian courts. 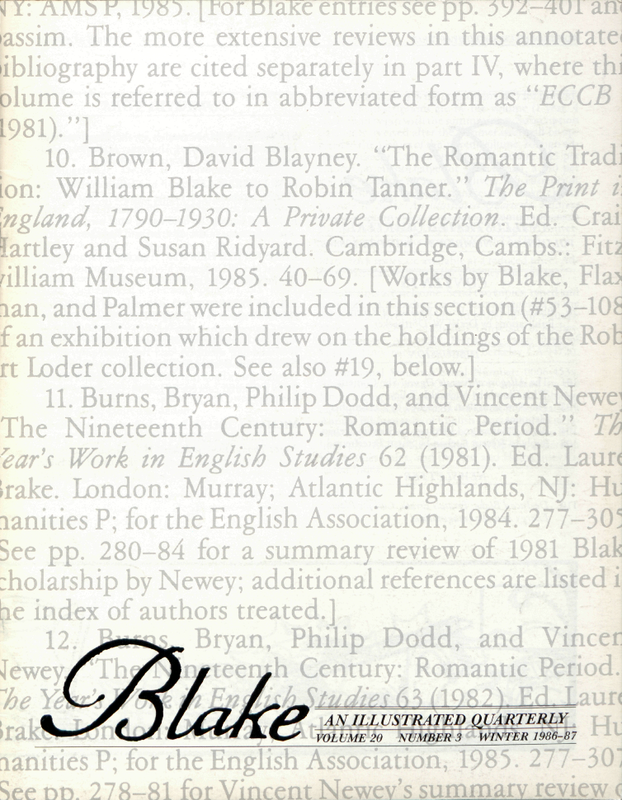 CHRISTOPHER HEPPNER, Associate Professor of English at McGill University, Montreal, has published articles on several aspects of Blake’s work. STUART PETERFREUND is the editor of Romanticism Past and Present (which will become Nineteenth-Century Contexts with its next volume), PSLS: The Newsletter of the Society for Literature and Science (of which he is a founding member), and the Proceedings of the Northeastern University Center for Literary Studies. He is working on a book that studies the emergence of energy as a cultural concept in English during the period 1775-1825. MICHAEL J. TOLLEY, Reader in English at the University of Adelaide, is currently at work on the page-by-page Night Thoughts commentary. He postpones to another year or ten his massive study of Blake’s use of the Bible.